Two professors at The Art Institute of Chicago have published a new book, The Studio Reader, a compendium of essays by different artists and theorists concerning both the physical and conceptual space where art is made it. What's so interesting about the text is how it undresses so many popular notions about what and where a studio is. Cultural imagination has long been dominated by images of the studio as a illusive and esoteric, if not magical, space where the isolated artist spends sleepless nights facing down the muses. Countless photographs in contemporary catalogs share this idea, be they of Francis Bacon's mare's nest London, or Jackson Pollock's cramped barn in East Hampton, or Bruce Nauman's ranch in New Mexico. Most working artists have different ideas about their studio: yes, it is a place where lightning is said to occasionally strike, but it is also a place where coffee is brewed, the paper is read, the dog takes a nap. What does the studio mean to you, and where is it? For some the studio is a free-standing garage, for others a converted store front, for some the kitchen table. Where is your place of practice? Art Critic Jerry Saltz is licking the salt from his Work of Art: The Next Great Artist wounds. Art Critic Jerry Saltz appears to have endured a few professional barbs due to his involvement with Bravo’s Work of Art: The Next Great Artist. The reality show pitted fourteen emerging artists against each other for a $100,000 prize and an exhibit at the Brooklyn Museum. Now that the first season is over-- Saltz is licking his wounds in that he is admitting-- at least from what I gather from his article-- that Work of Art: The Next Great Artist was a bad move for the respectability of art and perhaps a bad move for his career as an art critic. Ask the Editor: Where should I sell my artwork online? As the Senior Editor of MYARTSPACE.com it is not uncommon for me to receive requests for advice from artists. One of the most asked about subjects happens to be focused on selling art online. It is safe to say that I receive at least a dozen to well over a hundred versions of this questions per month on Facebook, Twitter, or by email. Thus, I feel that I should tap into this question once again even though I know that I’ve covered it before on the Myartspace Blog. 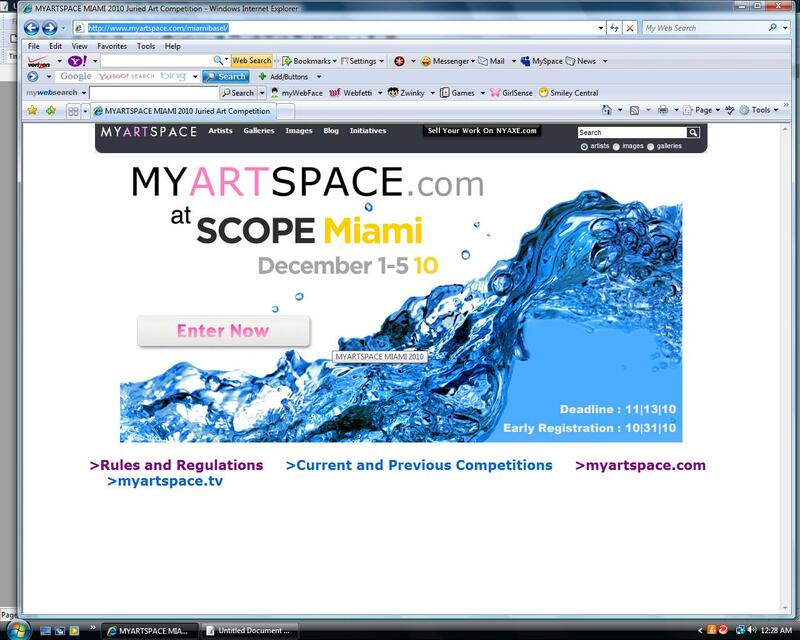 50 finalists, 3 winners, work represented at SCOPE Miami 2010 Art Show December 1-5, 2010 at the same time as Art Basel Miami Beach Art Fair. When Groundbreaking Artists Become Kitsch Where Does it Leave the Rest of Us? One negative aspect of the information driven times we live in-- and how it is reflected in our culture-- is the fact that great artists from the recent past often become kitsch figureheads. Take for example Frida Kahlo-- who is now more apt to be admired as a tattoo than heard about in a worth-while discussion about art. The history behind her work and the importance of what she achieved is often forgotten in exchange for a watered down reflection of who she was and what her artwork represented.